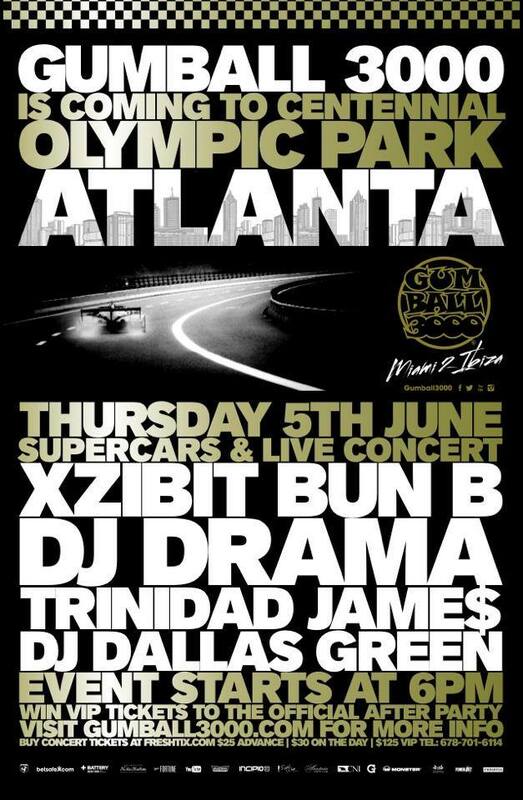 Xzibit, Bun B, DJ Drama, Trinidad Jame$ and DJ Dallas Green take to the stage in Atlanta’s Centennial Olympic Park in a never-before-seen line-up to celebrate the explosive arrival of the superstars and supercars of the Gumball Rally 2014 on Thursday June 5th. Gumball 3000 2014 is kicking off in Miami and travelling across two continents, five countries and one ocean to Ibiza, with 100 rare cars ranging from Lamborghini’s to Batmobile’s, and stars including Eve, Deadmau5, Tinie Tempah, David Hasselhoff and more. Be one of the lucky few to get up close to the Gumball Rally as it arrives in Atlanta for the first time, and experience the hip hop legends Bun B, Trinidad Jame$, Xzibit and DJ Drama together on stage for the first time.